A marriage of Irish whiskey in Bordeaux wine casks to create an intriguing whiskey wrapped up in a sophisticated pack that blends the heritage of two family dynasties eloquently. This collaboration took half a decade to get from concept to delivery, and it was worth every minute of the wait. The story of the two families is a fascinating one, both of Irish descent, both have a strong and persistent family lineage and both are heavily involved in the alcohol industry but that’s where the similarities end. From the humble baking background of William Mitchell, the Mitchell family became wine merchants and were based Grafton Road, Dublin (no a McDonalds, how tragic) who started storing in bond and bottling Green Spot in around 1887, subsequently adding Yellow Spot and Red Spot (now Red Breast). A generation or two earlier, the Barton family moved from Ireland to France in 1725 and set themselves up as a wine merchant and have occupied Chateau Léoville-Barton, a Second Growth, ever since 1836 although the chateau itself, formerly part of the vast Léoville estate, dates back to 1772. I was fortunate enough to be in Bordeaux for the launch of this new expression, speaking at the event Jonathan Mitchell said “when I was approached about this project a number of years ago, there was only one family with the Irish connection in Bordeaux that I wanted to work with and that made sense. That was The Bartons." The product itself has depth and intrigue in abundance, the maturation of Green Spot Château Léoville Barton was first matured in a mix of new American oak barrels, ex-Bourbon and ex-Oloroso Sherry before being aged in ex-Bordeaux wine casks for between 12 and 24 months. 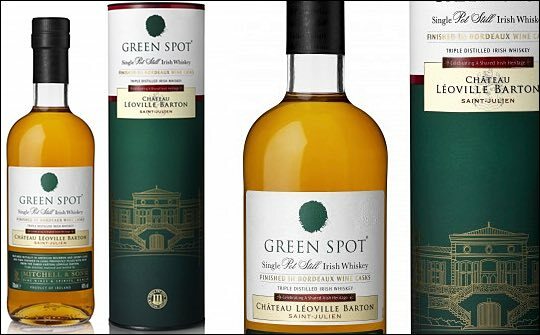 For a while now, the mainline Green Spot and Yellow Spot packs have been a lovely symbol of design simplicity with great shelf standout so I was naturally curious as to how they would nuance this aesthetic for the Green Spot Château Léoville Barton cask finish release without breaking all that good design work. The secondary pack exudes confidence, replacing the typical cask shot with a luscious green backdrop with a subtle gold outline of the Château Léoville Barton. They have managed to maintain the cleanliness of design and lots of white space despite including four additional pack assets. What are these new pack assets? Tasteful red wine cues, since you ask. By red wine cues I am talking about the faux-wine label on the front of the outer pack with the Château Léoville Barton crest ghosted behind the name of the place. Above this there’s a red line that is not solid red but is a blend of dark and darker reds to make it feel liquid, maybe even capturing some element of movement or the flowing of the red wine. An embossed cask with a laurel surround and the words ‘matured in wine casks’ add an additional layer of authenticity to the pack and product story. This is all reflected on the primary pack’s label, albeit in smaller proportions to keep the label at a size that conveys the necessary information but also allows the product’s colour to speak for its self. Detailed tasting notes are present on the back label along with the expected explanation of what single pot still whiskey is, evident on many Midleton-distilled products. I was a bit confused as to why the stand-out Green Spot stopper, with its literal green spot present, did not have a wisp or flash of the deep flowing red band that we have seen elsewhere on the pack, I think that would have really finished it off. All in all, I really like this pack, it does a great job for me in premiumising a product that was already good but now has a tier above that allows whiskey explorers to try a new expression, preferably side by side with the original. Greg is a freelance brand strategist for hire specialising in creating compelling brand positioning / propositions, creative platforms and all things strategic for whisky and other luxury spirits, he also authors multi-award nominated GreatDrams.com, a site for whisky drinkers and learners alike and can be contacted on greg@greatdrams.com or over at Facebook.com/GreatDrams.